I recently signed up for ipsy. 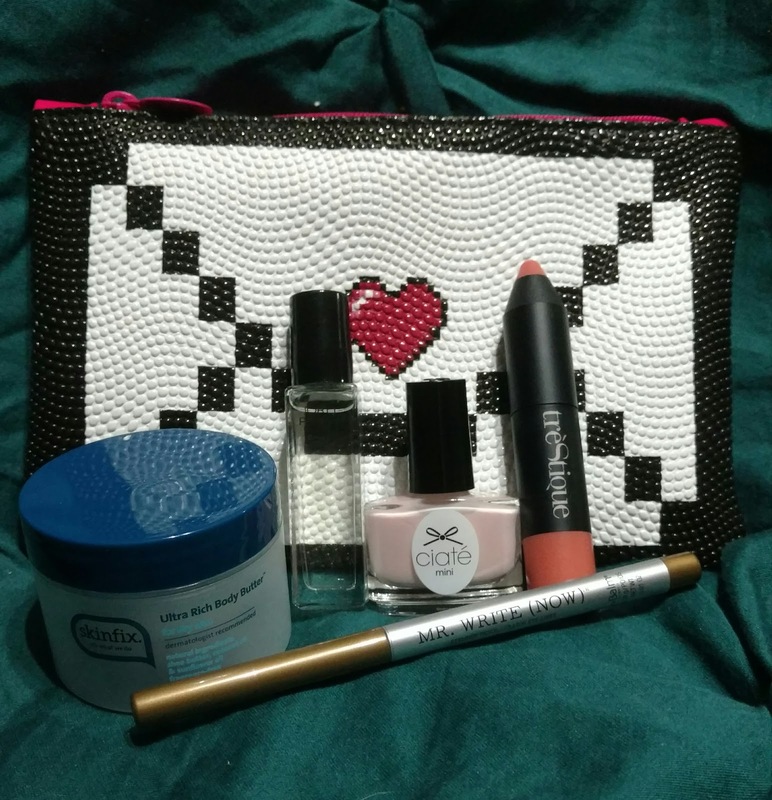 It's a monthly service that sends you five sample beauty products in a cute little bag all for $10. They determine what to send you based on a so-called style quiz (you can retake it as many times as you want). The site also offers discounts on the products they send you samples of and does a lot of giveaways. I got my first glam bag a couple of weeks ago and wanted to share my impression of the products I received. I'll be sharing them in order of my favorite to least favorite, tell you what I did or didn't like about each one and if I would order it again. Product Description - Feel like you've been whisked away with Eau so Divine! This calming perfume has notes of sandalwood, lily of the valley, Egyptian myrrh and Madagascar vanilla for a truly exotic scent experience. I really, really like this perfume, which makes sense considering lilies are my favorite flower. The scent was complimentary with my body chemistry, not over-powering and lasted all day. I would definitely buy this perfume. Retail price ranges from $23-57. Product Description - A new generation cream-gel blush. Formulated to glide on skin with an elegant silky touch, leaving cheeks with a pop of soft color. This cream blush was easy to apply. The color is pretty, although it is very light even for my skin tone. I combined it with a little powder blush in a slightly-darker shade to achieve my desired color. It lasted all day. These blush sticks retail for $34, which is above my makeup price range for blush. Product Description - The limited-edition Olivia Palermo x Ciaté London Nail Collection is inspired by the trendiest shades of the season. Formulated by the fashionista herself, this polish is a long lasting, durable, high-shine lacquer. It's all you need to achieve the look of polished perfection! I've had my toenails painted with this polish for three days now (I rarely paint my nails because I work on a computer all day so it doesn't last). So far so good as far as chipping is concerned. However, it took three coats before it wasn't see-through and it took awhile to dry. In fact, I ended up getting out my hair dryer. The color is pretty, but I actually have an OPI polish that is basically the same color, and it only takes one coat. It's also cheaper than this one which retails for $24 so I won't be purchasing. Product Description - Skinfix Ultra Rich Body Butter is a dermatologist recommended, luxurious body butter that leaves skin soft, supple and healthy all day. Available at ULTA Beauty and Target. This body butter was really thick. It had a light scent that faded quickly. I can definitely tell a difference in my skin since I've been using it. You can get an 8 oz. jar of this at Target for about $15, so unless my skin is in seriously bad shape I doubt I'll be purchasing. Product Description - We have a Mr. Write (Now) for every day of the week... and then some! Meet this new collection of attractive eyeliners that are truly easy on the eyes. These pencils deliver the long-lasting color you've been looking for, and have built-in sharpeners so they are always ready when you are. With high payoff, eight wearable shades, and a satin smooth texture, we understand why your eyes wander- but rest assured, your eyeliner won't! This was my least favorite product simply because of the color. If you don't take the color into account, this eyeliner is great. It's easy to apply, goes on smooth and lasts all day. The bronze is a little too sparkly for my personal taste. However, they do have seven more colors. The retail price is $17. When I run out of my usual eyeliner, I might order this in mocha. Overall, I was pleased with my first glam bag. The bag itself looks like a little love letter - so cute! And it's a great size; I'm using it to hold all my lipsticks so they're not just rolling around the bottom of my purse. I would recommend ipsy to anyone who wants to experiment with new products but doesn't want to feel like they're wasting a ton of money to do so.